A new investigation finds that C-section rates vary widely from hospital to hospital. Find out how yours ranks before you decide where to deliver. Although sometimes C-sections are necessary, mounting evidence shows that there are far more of them than there should be. An investigation by Consumer Reports finds that the rate of C-section deliveries for low-risk women may be as much as nine times higher depending on the hospital—a huge range. So why is there such a difference? The report, which looked at over 1,300 medical centers across the US, finds the hospital differences in C-section rate varied even in the same communities and among similar facilities, so pregnant women should take notice. You can look up your hospital to see how it rates—and if you're not happy with the results, talk to your doctor about your concerns, and consider switching. But, there could be reasons for the differences that do make sense, says Clara Ward, MD, a maternal-fetal medicine specialist with McGovern Medical School at UTHealth and Children's Memorial Hermann Hospital in Houston. "Hospitals that handle more urgent and complicated cases often have a higher C-section rate," she tells Fit Pregnancy. "A big problem [with the report] is how they are defining low risk: women with a first pregnancy where the baby is a singleton in the correct position." But, she says, there are other factors like age, weight or medical condition that could actually impact their chance of a cesarean. In addition, a low-risk case can become high risk during delivery. "Complications can develop quickly, which may make the safest plan a transfer to a high-risk specialist and/or a tertiary [specialized] hospital that is more equipped to care for mom and baby," she says. So the initial hospital's cesarean rates stay lower while the second one rises. Although one study in the medical journal Birth showed that over half of the women polled said they would travel 20 miles further to give birth in a hospital with a C-section rate 20 percent lower, that rate is only one of many factors you should consider when choosing where to deliver. "Women should choose a physician or midwife with whom they feel comfortable—and a location that is convenient in the event of an emergency," Dr. Ward says. The medical community, though, is starting to recognize the need to lower the rate of C-sections in the US, which at over 30 percent is more than double what the World Health Organization (WHO) says it should be. Dr. Ward's hospital recently created the March of Dimes Perinatal Safety Center focusing on mom and baby health—including reducing elective deliveries like C-sections before 39 weeks. 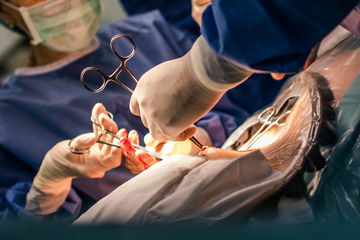 C-sections can be life-saving, but they are major surgery that can increase a woman's chances of life-threatening complications like infection and blood clots. The American College of Obstetricians and Gynecologists (ACOG) also recently issued new guidelines for doctors recommending fewer medical interventions in delivery, which could reduce the C-section rate. "Patience in watching the progress of labor, and continuous support during labor have been associated in some studies with a reduced risk of cesarean delivery," author Jeffrey Ecker, MD, chief of OBGYN at Massachusetts General Hospital in Boston, told Fit Pregnancy when we spoke to him about the guidelines. When talking to your doctors, make sure they are aware and supportive of this new approach to labor and delivery. And don't be afraid to speak up about your concerns over C-sections. Of course, you might not have that much of a choice of where to give birth, depending on insurance or where you live—but even if your hospital doesn't rank well in CR's investigation, it's still worth talking with your doctor about the reasons why, and your wishes to avoid one. The most important thing is to build trust with your provider, and come up with a birth plan you both can be happy with. "It is always a great idea to discuss your expectations for delivery with your physician or midwife, and what steps are reasonable to decrease the chance of a C-section," Dr. Ward says.